Fit Factory Wins 2018 Readers Choice Award! Blog > June 2018 > Fit Factory Wins 2018 Readers Choice Award! Fit Factory is extremely proud to announce that we've been voted as a favorite health club in the area by Wicked Local! 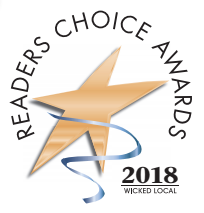 Alll three of our current locations in Braintree, Kingston, and Foxboro, have officially won 2018 Readers Choice Awards for their respective geographical areas! We're so excited to be adding a new location in North Attleboro this summer, and look fowards to the opportunity of serving another incredible community! We’d like to thank our loyal members, staff, and everyone who's supported us over the past three years - none of this would have been possible without all of you! Interested in finding out what makes Fit Factory so great for yourself? Try us out - there's no risk with our 7-day satisfaction guarantee because we know what you deserve in a health club!